The Canada-China Culture Development Association (“CCCDA”) presents an evening of silver screen classics, from Hollywood and China, with iconic soundtracks in concert. Beijing’s China Broadcasting Film Symphony Orchestra (“CBFSO”) celebrates the magic of the movies with Cinema in Concert, this January at the Orpheum in Vancouver. The 80-piece CBFSO will perform with special guest soloists from within the local music community, including the 100-member local community choral group, the Vancouver Folk Song and Dance Troupe. Led by acclaimed conductor Pang Ka Pang, the internationally-renowned CBFSO will perform dramatic themes from Oscar-winning masterpieces, while iconic scenes are projected above them. One of China’s finest symphony orchestras – known to sell out concert halls around the globe, the 80-member ensemble will bring new life to film scores including Braveheart, Casablanca, Jurassic World, Legends of the Fall, and Pirates of the Caribbean, as well as beloved works from China’s cinematic canon. In total, the evening will feature compositions from five Oscar-winning composers. Between the five, they boast a remarkable eight Academy Awards and a total of 45 nominations. 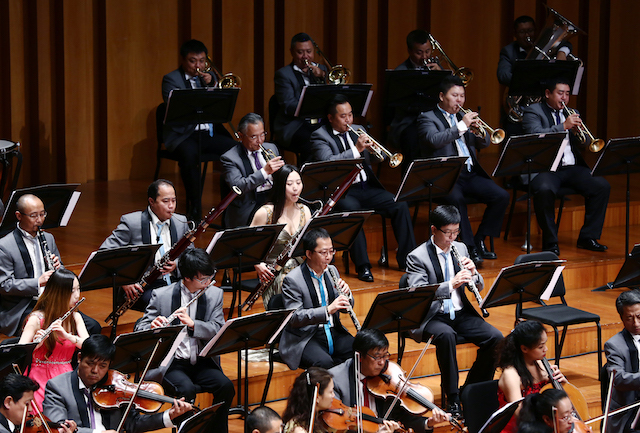 Founded in 1949, as the earliest China national symphony orchestra, the China Broadcasting Film Symphony Orchestra (CBFSO) has performed and recorded music of nearly 2,000 films, TV dramas and documentaries. Since its first tour abroad in 1992, the orchestra has performed in more than 40 countries on five continents, and worked closely with renowned conductors, composers, dancers and performers. I will draw one winner at random from all entries at 12:00pm on Thursday, December 28, 2017. Follow the Canada-China Cultural Development Association on Facebook and Twitter for more information. Update The winner is Marisa P! great prize! looks like an interesting concert to attend! I would like to attend this! This sounds marvelous! Fingers crossed so I can bering the entire family. my daughter has just started to learn how to play the clarinet and has been asking about going to a symphony – she would love this event! This will be such a great treat! I’d love to go!!!! thx! I love listening to orchestral music playing songs I recognize. The family would love this. I was sad to miss the Indiana Jones show with the symphony. My husband and I would love to go! Pang Ka Pang is very good.